The University awarded bachelor degree programme Fashion with Textiles Design is aimed at students who intend to pursue careers as Fashion and/or Textiles Designers and involves both conceptual and trend driven design work through experimentation with creative cutting techniques, traditional pattern cutting, textiles, research, illustration, business and manufacturing skills and culminates in a final professional collection show and portfolio outcome exhibition. The UK fashion industry alone consists of over 800,000 people. This programme will provide you with the skills you need to get on in this exciting and lucrative industry. 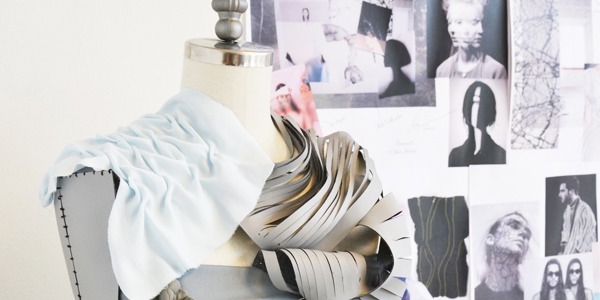 The Fashion with Textiles Design BA (Hons) offers you a nurturing environment where you will develop industry standard skills in both fashion and textiles. You will expand your skills in pattern cutting, production techniques, CAD and design. We will give you what you need to set you on your way to become an independent creative thinker who can come up with innovative solutions in an ever evolving industry. The course is taught through a series of practical project assignments, with key emphasis on quality of products and innovative design. The practical modules are delivered through a variety of workshops, demonstrations, lectures and seminars, but the most important aspect of this programme is that you become an individual designer. Thanks to our small classes and commitment we can achieve this together by providing each individual student with one to one tuition time every week. We pride ourselves on our commitment to our students. We recognise that giving each student substantial personal support is key to helping them get the most out of the course and themselves and help them successfully enter into the international world of fashion and textiles. Students who successfully complete the programme will be awarded a UK validated Bachelor’s honours degree in Fashion & Textiles Design. In accordance with UK requirements 120 credits points are available each year of study and students need to obtain 360 credits for successful completion of the three-years course.